Halloween is many people's favorite holiday but it isn't for everyone. Maybe you're the type who doesn't like Halloween, or you just didn't get around to buying treats this year. Perhaps it's that you feel you're entitled to relax and enjoy a book or your favorite TV show without interruption, regardless of whether the calendar says it's October 31. If you live in an area that's popular with trick or treaters, there are ways you can alert your neighbors that you're not participating without offending anyone. If you live in a house try turning off any outside lights you may have and closing the curtains on your street-facing windows. Basically, try to make it look like no one is home. While you may still have an eager child brave the dark walk up to your door, most will take the hint that you're not participating. If you don't want treat-seekers knocking on your door all evening, alerting visitors with a sign should do the trick. You can write a straightforward "Sorry, no trick-or-treating here" or be a little cute with something like "The skeletons took all the treats! Maybe you can find more at the next door..."
Children who aren't yet old enough to read would no doubt be accompanied by a parent, who would then instruct their kids to move on to the next door. Put the treat-giving on auto-pilot. As an alternative, if you don't mind Halloween but it's the interruption from trick-or-treaters that you want to avoid, consider pretending you're not home but are leaving treats outside your door for children to take in lieu of knocking. If you're really determined to avoid participating in the holiday try going out for a while. Trick or treating is meant for children so it's rare to find children still out past eight or nine, especially if Halloween falls on a school night. Why not use the holiday as an excuse to enjoy a late dinner or evening out with a friend to get yourself away from your apartment during peak trick-or-treating hours. Don't be mean to children or their parents. 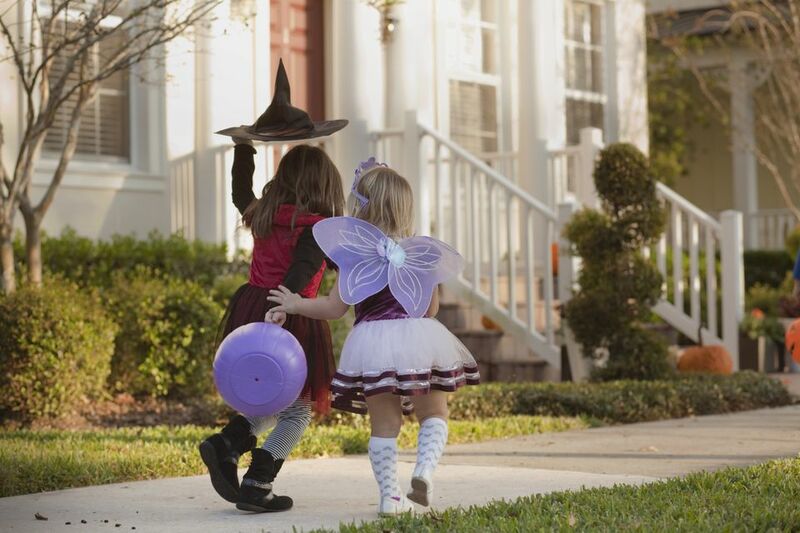 Avoid starting feuds with trick-or-treaters and their parents on Halloween. It's just not worth it, especially considering the lasting damage it can do to your relationship with your neighbors. Kids are just eager to show off their costumes and get treats, and parents want to see their children enjoy a happy and safe holiday. So, if you feel like spooking your neighbor with an unkind word, remember that Halloween only comes once a year but you have to live there every day.